"Yes, 9/11 could have been avoided, but do not blame President Clinton or Bush!" Could 9/11 have been avoided? The answer is a clear and sound: YES! There were lots of bureaucratic mistakes and mismanagement made by the agencies responsible for anti-terrorist activities in the U.S. including the CIA and FBI between 1998 and 9/11. There was no credible Anti-Terrorist Strategy until 9/11 even after the first bombing of the World Trade Centre by Islamic radicals and the attacks on the U.S. Embassies in Kenya and Tanzania in 1998. I will concentrate only on the question of attacking Al Qaeda and killing its leadership in Afghanistan, a country I know from my visits to the Mujahedeens during the Soviet war when I wrote the report on Afghanistan for the European Parliament, from meeting Pakistan’s Prime Minister Zia Hul Haq and representatives from all the different groups in Afghanistan and Peshawar in 1985. After the withdrawal of the Soviet troops from Afghanistan, Osama bin Laden lost his mission and perverted his militant interpretation of Islam to a "killing ideology" like Adolf Hitler did in the 1920s and 1930s in Germany with his rude and inhuman Nazi-propaganda and later mass murders of Jews in concentration camps. After the attacks against the U.S. Embassies in Kenya and Tanzania in 1998, the appropriate and necessary U.S. action should have been to wipe out bin Laden’s infrastructure by permanent and massive covert and military actions starting in 1998 to 2001. 9/11 could have been prevented by early and intensive actions aimed at killing Osama bin Laden and his leadership, using armed Predator aircrafts, special-forces operations and targeted bombing of terrorist training camps in Afghanistan during the build-up-phase of his terror network. To prevent 9/11 by military strikes in the year 2001 was not possible any more, it was already too late. The living time bombs - the pilots of 9/11 – were in the US already, the operations have been prepared and "ready to go like a loaded gun" in the U.S.A. not Afghanistan any more. Therefore to blame President Bush for not striking Al Qaeda in Afghanistan is not fair. Yes, several wrong decisions were made by senior officials of the CIA and the White House National Security Council. They collected more and more information instead of taking actions. Only once in August 1998 they sent 60 Cruise Missiles to Bin Laden’s camps, which was more a demonstration of weakness with a PR effect than an effective strategy. It was too little - a show of force without lasting effect on the ground. 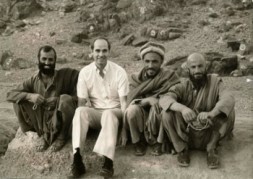 WSN President Dr. Hubertus Hoffmann visiting the Mujahedeens from the Gailani-Group in the Tribal Areas - where Osama Bin Laden is hiding now - in the mountains near the Kyber pass in Afghanistan in 1985, supporting the Freedom Fighters of that time during the Soviet invasion and writing the Report on Afghanistan for the European Parliament. First, not to try to kill Osama bin Laden, but to capture him. This was impossible in the mountains of Afghanistan. Second, not to bomb intensively his camps several times since 1998 combined with US Special Forces operations on the ground. Third, not to aggressively contain and focus with imagination on Al Qaida with an Action Plan, but to engage in long theoretical and intellectual discussions on strategy in Washington D.C.
At the White House: In my opinion not President Clinton or later President Bush - whose level of attention did not involve them in more technical counter actions against Al Qaeda - but their terrorism specialists, the National Security Advisors and staff, who were too uncoordinated, too slow and too soft. They failed to develop a credible U.S. Anti Terror Strategy and an Action Plan versus Al Qaeda and thus left their Presidents in the dark, who would have otherwise supported a more active strategy. We need a global Anti-Terror-Strategy and an Action Plan of the Western World pushed in the UN and NATO with sufficient details on all administrative levels. A central part of the strategy should be the prevention of terrorist attacks sooner, with more aggressive and intensive actions. Launching U.S. or NATO pre-emptive strikes in the countries harbouring terrorists is absolutely necessary to prevent another 9/11. Both President Bush and Senator Kerry should learn those lessons from the important 9/11 hearings of the National Commission on Terrorist Attacks.